It’s soup season! Which also means it’s time to break out the Crock Pot. I love cooking in the Crock Pot because it’s so easy. Spend a little time in the morning prepping a few ingredients, and by the time you get home from work you have a delicious dinner and leftovers for lunch tomorrow. I like this dish in particular because it tastes indulgent but it’s still fairly healthy. 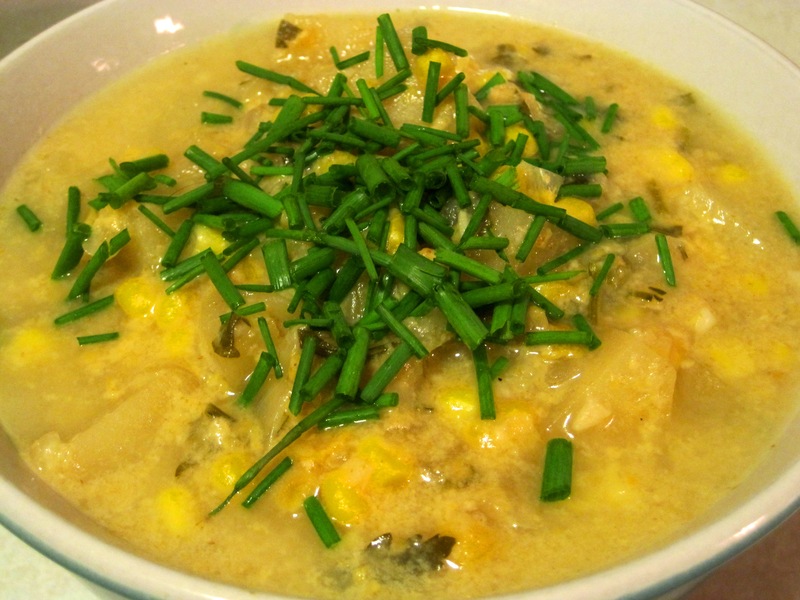 I love chowders and cream-of-whatever-soups, but they’re often not figure-friendly. In this dish, I swapped out some of the less healthy options for healthier ones (did you know they made reduced fat evaporated milk?!). I kept the potatoes because a chowder has to have potatoes, but you’re really not eating too much of them with the amount of servings this makes. Just serve this creamy soup with a tossed green salad and crusty French bread for a complete, delicious family meal. Creamy, sweet, with spice from the cumin makes this a delicious cold weather meal. 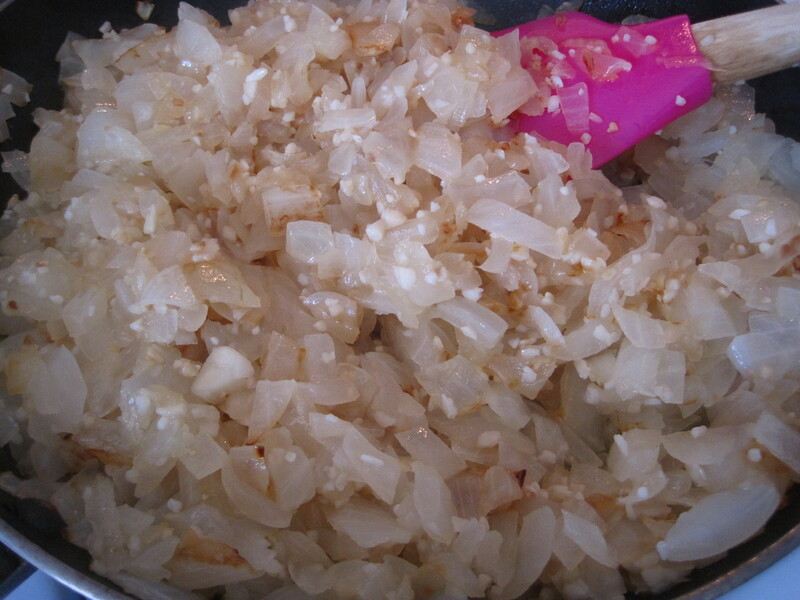 In a medium skillet over medium-high heat, sauté the onion and garlic in the oil until golden. There’s the golden color we’re looking for. That’s when the onions and garlic lose their bite and become sweet. While the garlic and onion cooks, peel and chop your potatoes. Throw them into the crock pot as you go. 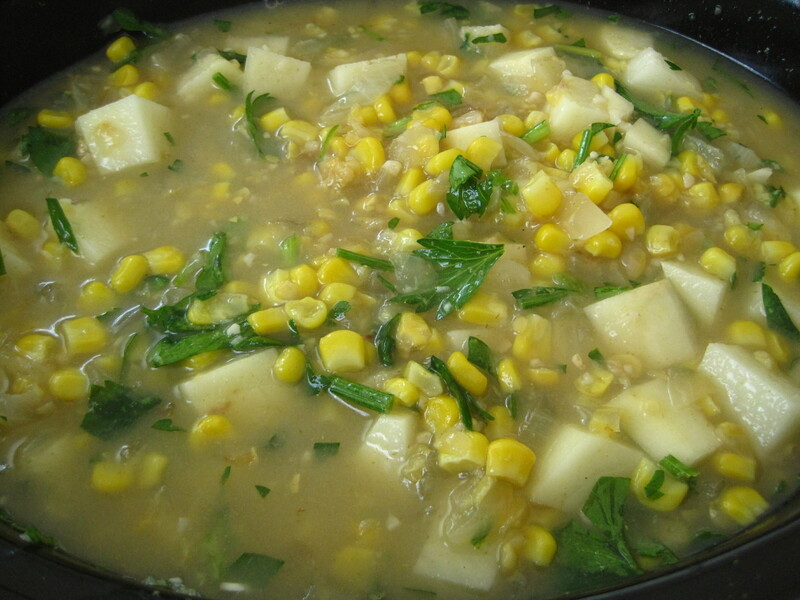 Add the can of creamed corn, frozen (or fresh) corn, parsley, and cumin. Add the onion and garlic when it’s done cooking. Pour the chicken broth over the top and mix thoroughly. I love the cumin in this dish. It gives the dish an unexpected warmth. Cover. Cook on low for 8-9 hours or until the potatoes are tender. In the last hour of cooking, add the cheese and evaporated milk. Garnish with chives before serving. If you like this dish, check out my Turkey Bacon and Lentil Soup.